Sherie Judah, co-owner of American Jewel, on the value of accessories and the even greater importance of staying loyal to retail partners. Within an hour at that first swap meet, the Judahs’ inventory sold out. “That’s when I decided to take the business on the road,” she says. The couple hit the trade show circuit, making stops in Atlanta, Las Vegas, Dallas and New York. It marked six months of steady growth. But it wasn’t until Justice placed an order that sales surged. “We could barely keep up,” Judah says, adding that they’ve now settled into a 15,000-square-foot warehouse in Valencia, CA, with a staff of around 35 employees. Illustrative of her self-proclaimed motto, “expect the unexpected,” Judah now sits at the helm of a fast growing, multi-million-dollar tween accessory business. Alongside her husband, Saul, American Jewel manufactures hundreds of trendy SKUs for tweens annually. 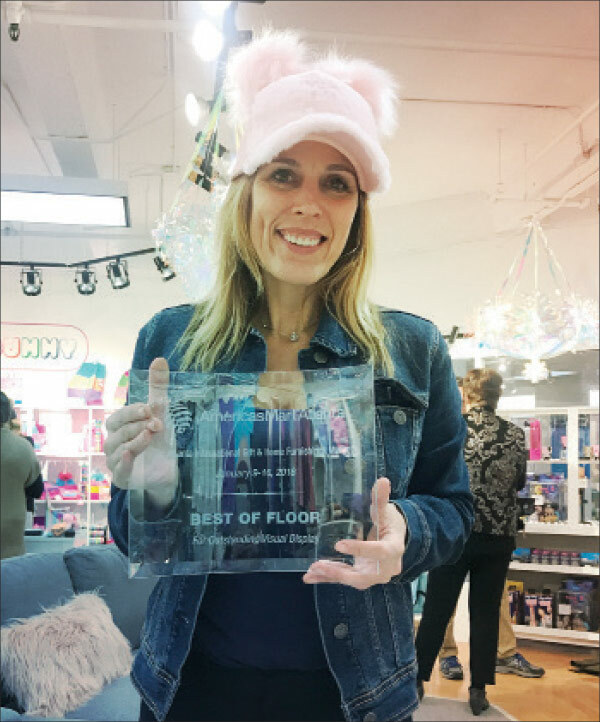 Just in the past four years, the business has grown to offer an expansive range of glitter totes, makeup bags, pompom caps, charm chokers, phone purses, animal-eared headphones and the company’s best-selling “Yummy Gummy” scented bags. Retailers report that it’s tough to keep the goods in stock. One kiosk owner in Puerto Rico says she sold out while still unpacking the order. Another retailer from Nashville informed Judah at the Atlanta Gift Show last year that American Jewel was solely responsible for covering her store’s rent. How do you stay on top of the fast-paced tween market? There’s about 15 fashion colleges that I keep an eye on at all times. I find it beneficial to watch what college girls are up to, as they inspire younger girls. In addition, I always have my nose in fashion reports and magazines. But it’s not your stereotypical Vogue—that’s too harsh for our market. Most of my inspiration comes from fitness magazines where I can hone in on those lifestyle-driven athleisure trends tweens love. Other than that, I listen to my retail partners about what they think will give their customer that “wow” factor when they walk in. Lots of patterns, as well as tons of glitter and iridescent materials. Designers are combining all the sparkly elements into giant masterpieces. Less is not necessarily more with this trend, and I suspect it’s going to be at least two years before all this iridescent stuff wears out. Any new additions that have performed exceptionally well? Our cat and unicorn headphones have been definitely an exciting venture. We started with the cat headphones around Christmas time, and I was a bit nervous because we’d never done electronics. We were very careful with the safety regulations, checking to make sure the volume didn’t have the possibility of damaging a child’s ears—even at full blast. We started with a small quantity (about 6,000 pieces) to see what would happen. Turns out the glittery kitty design was a hit, which is what prompted us to add unicorn headphones. What’s the next trendy animal expected to hit the scene? Pandas! Pandas will be coming in hot, and we’re ready with a panda backpack that has a fur hood with ears. It’s so freaking cute. We also offer the same design in cat and unicorn options. How often do you introduce new product? As often as possible. Our rule of thumb is every three months. Our retailers never get bored that way and their customers always have something to look forward to. In today’s retail landscape, newness is the key to survival. The faster you change up your selection, the harder it is for Amazon to keep up, which gives retailers a chance to sell it first. Is the retail climate as volatile as it appears? Yes! It’s no joke out there. I am honestly nervous for our industry. One of my favorite parts of doing business is going to the shows and seeing the shop owners, which kills me when I hear about them struggling. As a brand, I want to do everything I can to help them stay afloat. Whenever I design a new line, I make sure it tells a story so the retailer doesn’t have to try hard to make sense of it. Our new Disco Vibes collection caught such great reactions with the fur, glitter and metallic that all ties together in one cohesive story. The backpack matches the fur duffle bag, which matches the hat, which matches the wristlet, which matches the pencil case and so on. It creates a snowball effect when the customer goes to buy. They end up wanting everything! Another main goal this year has been to lower price points to really enable retailers to outsell online competitors like Amazon. What’s your sweet spot when it comes to price point? Our customer can buy something that’s as low as $5 up to $29.95. That’s where we typically cap our prices because it’s still attainable for a tween’s budget. There’s nothing more rewarding than seeing kids be able to go to stores and enjoy the experience of spending their hard-earned money on a quality, tangible item in that moment. That’s what it’s all about. What opportunities do accessories bring retailers? We’ve had so many people come up to us lately saying how much money accessories have made them in the past year. Many have even said that they’ve started bringing in more accessories than clothing. Retailers are finding that it’s much easier to sell because of the varied price points, lack of size restrictions, as well as just an easy item to pick up as a gift for a friend—or yourself! I highly recommend providing retailers with displays for product. For example, we give them a wooden display for our charms—like a Pandora for kids. These little details go a long way on the sales floor. How important is the direct-to-consumer channel for American Jewel? While it’s necessary to have a website and social media, at the end of the day we want to show that we’re here for our retailers. We do very little online business, as in maybe five to six orders per month. Retailers are our customers, and we don’t want to compete with them. We also have employees who consistently police any online sellers to make sure our price points don’t drop even 50 cents. If we see a drop, they are no longer allowed to sell American Jewel. Your approach runs counter to most others when it comes to selling online. Pretty much. At least it has worked for us, so far. We have an e-commerce site and social media channels, but they aren’t anything glamorous. This is all done on purpose, as we want our partners to realize we are 100 percent on their side. What’s the most effective way to reach new retailers? Trade shows. We attend at least 34 trade shows per year. We’re also trying to get better at cold calling. At trade shows though, you’re physically touching the product—falling in love with it, if you will. It’s a really fulfilling connection for both the brand and the retailer. Talking and connecting with others has always been something I’ve enjoyed. I’m a people person, first and foremost. In addition, I love the competition of trying to be the most original on the market. Our team loves coming out with something new and watching the stores have fun launching it. In the end, it’s about giving back to those who made this incredible opportunity possible for us. What’s your favorite hometown memory? I grew up in a small town, Saugus, CA, where I’d often go dirt biking with my friends. What was your first paying job? I worked the local swap meet at 8 years old. Then as a teen, I got a job as a Chuck E.Cheese party host. Reports on color scheme for 2019. What are the three things you’d bring to a deserted island? Unlimited supply of Chinese chicken salad, cherry sour balls and eggplant. If you could hire anyone, who would it be? Jennifer Ganz, the children’s accessories buyer for Lester’s.